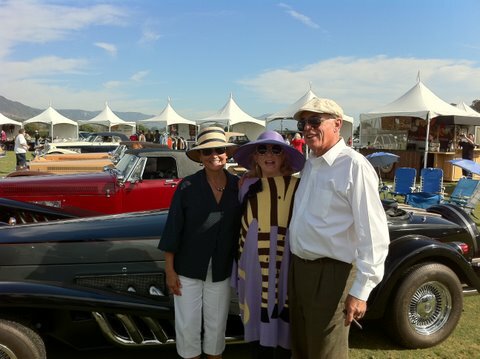 Kathy and Alain Clenet and I in front of a row of his 14 vintage Clenet cars. The Concours d’Elegance came to Santa Barbara and I couldn’t resist attending. It was a lovely autumn day. As always a wonderful assortment of cars were being shown — old cars, rare cars, “Woodies” one of which, a two seat convertible, I coveted. But what really caught my interest was “Bubble Fun”. Maybe you’ve seen it but I never have. It was something to keep the children amused once they’d had their fill of antique Rolls, Packards, Ferraris, etc. The concession consisted of an area with a big pile of plastic forms that will blow up into giant see through balls and a very large plastic pool of water. 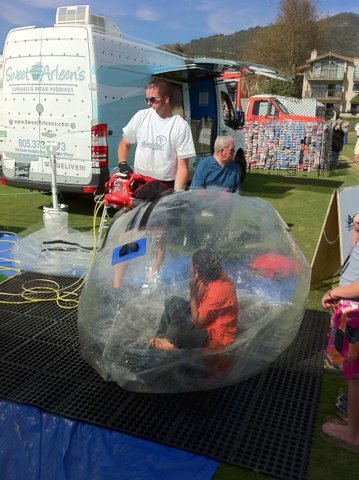 The children, one at a time, climb into one of these transparent plastic forms and a man blows them up with I presume oxygen because no one was gasping for breath. 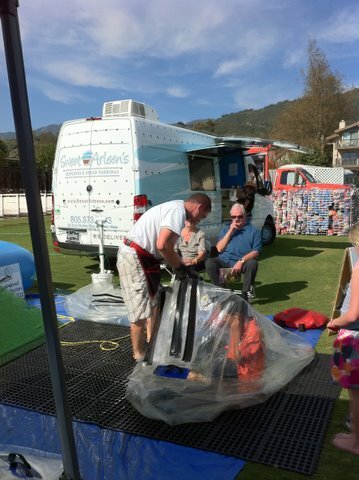 Once blown up to proper size they get zipped tight and rolled into the big plastic water-filled pool. 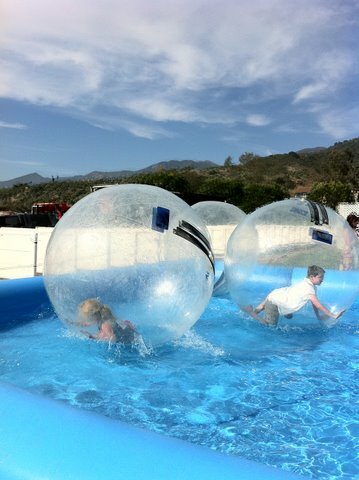 A woman standing near me comented “Just like my hamsters” as we watched the children running in the balls as they rolled over and over in the water. Actually a friend has just told me her grandson has a plastic bubble he blows up to put his hamster in at night to keep the family cat from getting it while they sleep. 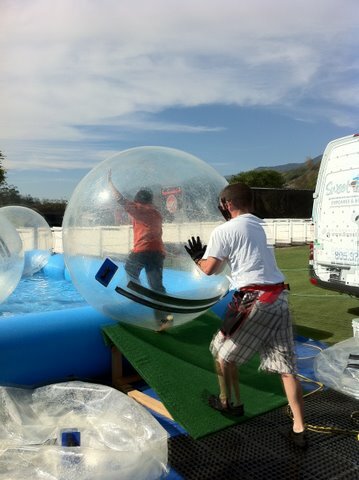 And the hamster seems totally comfortable in his bubble she reported. It looked like such fun! The friend I was with watched my enthusiasm cautiously and finally said, “Don’t get any ideas!” He was right. It was for children. Another highlight of this Concours was seeing my dear very long time friends Kathy and Alain Clenet and their children and grandchildren. And their extended family that included 14 of Alain’s legendary Clenet cars on display. An entire Clenet Car Club was represented. In 1975 Alain started building these fabulous cars in a garage in Santa Barbara. Ultimately he outgrew the garage and went on to airplane hangers. The cars were sheer luxury in every detail and were bought by customers like Silverster Stallone, King Husssein of Jordan and I remember one man from Saudi Arabia who ordered about 20 of the to give as gifts. Very expensive gifts! Alain later was designing cars in China and now he is… well he’s such an interesting man I’m going to let you Google him and get the whole story! Another friend Michael Gross has a brand new book out Unreal Estate that really captures the reader and holds them, especially anyone who knows the Los Angeles area. Having made a big success with his most recent book 740 Park Avenue telling the stories behind the billionaires who lived and live in this New York building at 740 Park Avenue, he is now telling all about the history of a group of old mansions in Beverly Hills, Bel Air, and Holmby Hills and all the gossip on the developers, oil millionaires and silent film stars who originally built them. He goes right through the various owners to the billionaires who now call these places home. Home does seem like much too cozy a word for me to use here. Don’t get ideas of a happy little house filled with happy people please. There was a small amount of information I was able to give Michael for this riveting new book and he very graciously acknowledged this in the book as my friend Lisa See acknowledged me in her best seller Snow Flower and the Secret Fan. I mention this because all I have to do is Google “Chinese Footbinding” and I can about 50 pages of sites for papers, articles and books now out on the subject I wrote the first complete book on in 1998 that have taken the majority of their material from my book. And no sign of any acknowledgement there! So I am most grateful to Michael and Lisa. But then they are big time authors with manners. We read about the books that sell over a million copies like these two authors but one wonders realistically how many copies do most books sell? I’ve always been pleased with how many tens of thousands my Splendid Slippers has sold since 1998, and still going strong in latest Random House printing. My other books have done as expected since two of them were expensive very focused books meant only for collectors, museum libraries, auction house libraries etc. One of these Kingfisher Blue with only 2,000 printed sold out and last year there were two used copies for sale for $1,350 each on Amazon. And they sold!! I called my publisher and asked if I was dead and didn’t know it. I didn’t know books of living authors could demand such a price. Now the $50 book can be bought used for about $300. Incidentally I made $4.70 a copy for this book! Well there was a decent advance too. But again what do most books sell? I started checking it out and found 500 copies is a good average. And now I discover that of the six shortlisted books for the coveted 2011 British Booker Award the best seller of the six was A. D. Miller’s Snowdrops. 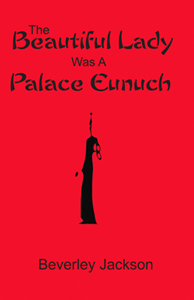 And this book sold only 11,800 copies! So if many of you think you are going to write a best seller and make millions of dollars, maybe you’d better spend that time doing something more promising! Love those bubbles, I am tempted to get one just for fun. It looks like a marvelous event, what an impressive collection of cars.